If you’re an angler looking for a new challenge, you may want to consider fishing for striped bass. Striped bass is a versatile and engaging quarry to fish for, and can be caught in a variety of ways. You can fish for smaller stripers in the 1 to 5-pound range, or go after behemoths weighing up to 80 pounds. Stripers can be caught in lakes, rivers, and the ocean, meaning the possibilities are nearly endless when it comes to catching striped bass. But in order to reliably catch striped bass, you’ve got to know how they operate – What they eat, where they tend to congregate, what their behaviors are and how to use that knowledge to get them to bite. Catching striped bass, especially from the shore, is possible with the right tackle, bait or lures and the correct approach. If you follow the information presented in this piece, you’ll be able to spend countless enjoyable hours catching striped bass from the shore. In order to catch striped bass, it’s helpful to know a little bit about the fish. Where do they live, what do they eat, how to behave in their natural habitat? Understanding striped bass allows us to find them out on the water and cast the right kind of bait or lures to entice a strike. Where Can You Find Striped Bass? In some ways, the question might better be: “Where CAN’T you find striped bass?” Striped bass is one of the most prolific game fish in North America, with fishery populations estimated at over 50 million fish in the United States. Originally, striped bass was found in the mid-Atlantic region in inland bays and rivers. Naturally, striped bass spawn and are born in freshwater but live their lives in the ocean. However, stripers can adapt to live their entire lives in freshwater. Striped bass has been introduced to countless lakes and rivers throughout the United States, Mexico, and Canada, and now you can find great striped bass fishing in nearly any state or location you choose. According to online striped bass guide Arkansas Stripers, striped bass are migratory fish, not tied down to any one spot over time. They like to travel to different bodies of water via rivers and other waterways and can be caught either on the river or in lakes, bays and other more stationary bodies of water. You can also fish for stripers in the ocean, but this guide will focus on freshwater striped bass fishing. What Does Striped Bass Eat? Striped bass is carnivorous, preying primarily on other fish. Minnows like shad and herring are favored foods of striped bass, but they’ll eat just about any smaller fish. And since striped bass can grow up to 80 pounds (though 20 to 40 is the average), just about any other fish is a smaller fish. Since striped bass eats fish, we’ll want to target them with either minnow as live bait or lures that simulate bait fish. How Does Striped Bass Behave? Striped bass is a schooling fish, and can be found in multiples out on the water. As such, if you see or catch striped bass, you can bet that there are more in the general area. 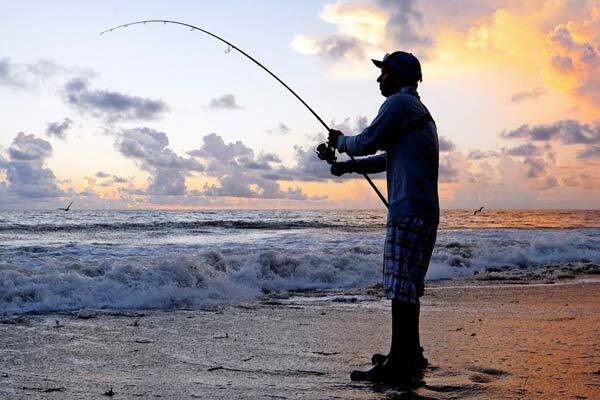 This means that you can end up with a run on striped bass, where you’re getting a bite every time you cast your bait or lure into the water. This is the dream scenario that you’re looking for when you fish for stripers. But striped bass moves around nearly constantly, so it’s not as easy as just finding a spot where they’re sitting and pulling one after another. The school will move around, so if you find one you’ll need to try to anticipate its movements and stay with it to continue to catch fish. The number one factor in where striped bass will be in the presence of the fish stripers feed on. Stripers go where the food is, meaning they will be found where the minnows or smaller fish congregate. 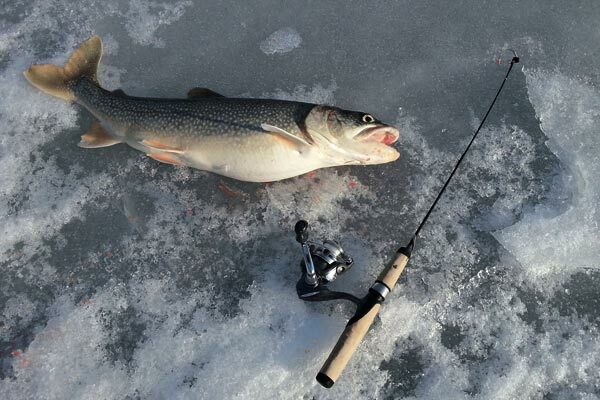 This can be underneath a dam, at a headwater, or any other location that attracts smaller fish. Locate minnows, and you’ll find the striped bass. According to Gone Outdoors writer Frank Whittlemore, looking for baitfish breaking the surface of the water is a great way to find a spot to fish for stripers. According to Field and Stream magazine, the best conditions for catching striped bass are on overcast days when the water is clear. Now that we have a decent understanding of how striped bass behaves, the next step in the process is figuring out how to catch them. The good news is that there are a variety of ways to catch striped bass, all of which can be appropriate for a given situation. 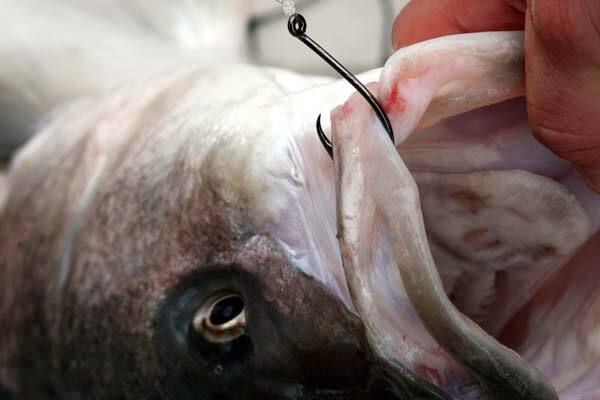 Depending on the season, time of day, the body of water and weather conditions, one or another tactic might be the best way to catch stripers. Regardless of your methods, there are some basic instructions you’ll probably need to follow. If you’re fishing for mature striped bass, you’re going to need to some heavy-duty tackle. Mature stripers tend to tip the scales at around 20 to 40 pounds, but if you run into a lunker you might have an 80 pound fish on the line. On top of that, stripers are known for their powerful initial run when hooked. This means you’ll want a rod, reel, and line capable of handling a fish of that size. 20 to 30-pound test line is ideal for fishing for mature stripers, along with a reel able to accommodate the line of that size. Of course, if you’re fishing for smaller stripers, you can scale down the size of your tackle. If fishing for stripers more in the 1 to 5-pound range, you can use tackle similar to what you’d use for fishing for smallmouth or largemouth bass, with a line more in the 2 to 5-pound test range. Many anglers prefer to catch striped bass with live bait, and it’s easy to understand why. Striped bass feeds almost exclusively on minnows and smaller fish, so throwing a minnow out there is a great way to get a striped bass’s attention. You can use just about any common bait fish when fishing for striped bass, with shad perhaps being the most popular. But bream, golden shiners, and other live bait species will also do the job. You can buy minnows at just about any bait or tackle shop in your local area, or you can catch the bait fish yourself if you’ve got the time and inclination. If you can locate an area near the shore where baitfish congregate, you can use a cast net to bring them in and store them as bait when fishing for stripers. Once you’ve got the bait, there are a variety of ways you can rig and fish it. The simplest and most direct is flatlining. You put a hook at the end of the line, hook the minnow through the lips or back, and let it swim. Other tactics include attaching a float or bobber to the line and regulating the depth at which the minnow swims and more complicated rigs involving weights which can be retrieved like lures. Regardless of your rig choice, you’ll want to make sure that your minnow is lively, replacing it when it grows sluggish. You’re trying to entice the stripers with its natural movement, so maintaining a lively minnow is important. Striped bass is opportunistic feeders, and have no problem eating dead or dying fish if they find them. Because of this, you can use cut bait or dead bait to target stripers as well. Most of the same live bait species are also appropriate as dead bait. When fishing with cut bait or dead bait, you’ll want to sink the bait to the bottom with weights. According to Bass Pro Shops, some of the largest striped basses ever recorded have been caught using dead bait or cut bait. Often times, when fishing this way you should be prepared to also catch catfish, as they too patrol the bottom of the lake or river looking for dead fish. While live bait anglers catch their fair share of stripers, one of the most thrilling experiences can be fishing for striped bass with lures. Lure fishing often times requires a bit more know-how, as you can’t rely on the natural look, smell, and movement of the bait to sell the fish on biting. But the reward can be spectacular surface strikes and the ability to entice stripers into biting even in difficult conditions. According to striped bass guide Captain Vincent Daniello, one of the best lures for targeting stripers when conditions are right is topwater lures. 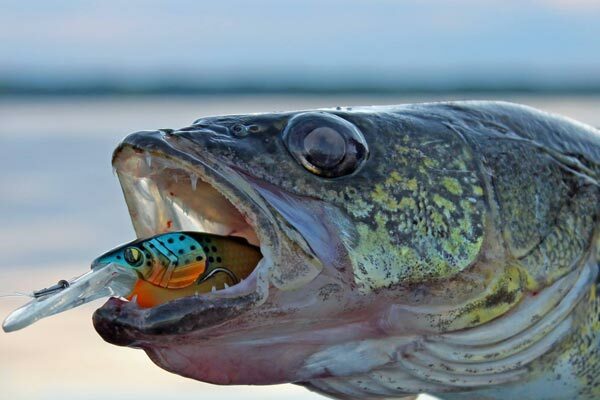 Poppers, stick baits and other topwater lures can trigger stripers into huge strikes, shattering the surface of the water as they hit the lure. This is one of the most exhilarating experiences in angling, and for many anglers is the preferred way to catch striped bass. 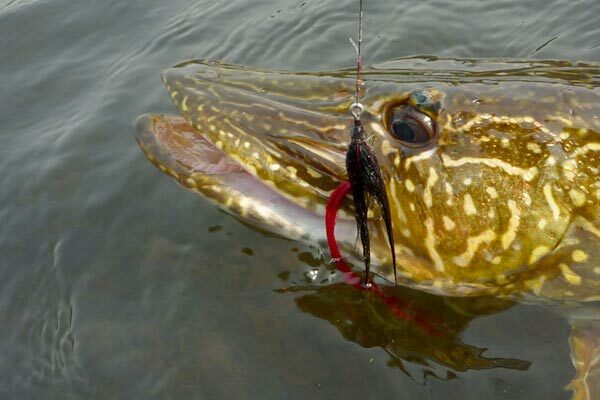 You’ll experience the most success fishing with topwater lures at peak feeding times – early morning and toward dusk. You’ll want to find an area where you can observe minnows and small fish coming to the surface, and cast your lure in that area. Retrieve the lure with a jerking motion to upset the surface of the water and wait for the striper to strike. This YouTube video shows an angler using a lure to catch striped bass. It gives you an idea of how to retrieve a lure to entice striped bass into striking.